I've been known to dip in and out of the retro style, I love a bit of genuine vintage and have dabbled in the whole repro thing too. I've had dresses from other repro brands but I always seem to go back to Collectif. I think, when you're talking vintage clothing UK based at least, Collectif do it like no other. 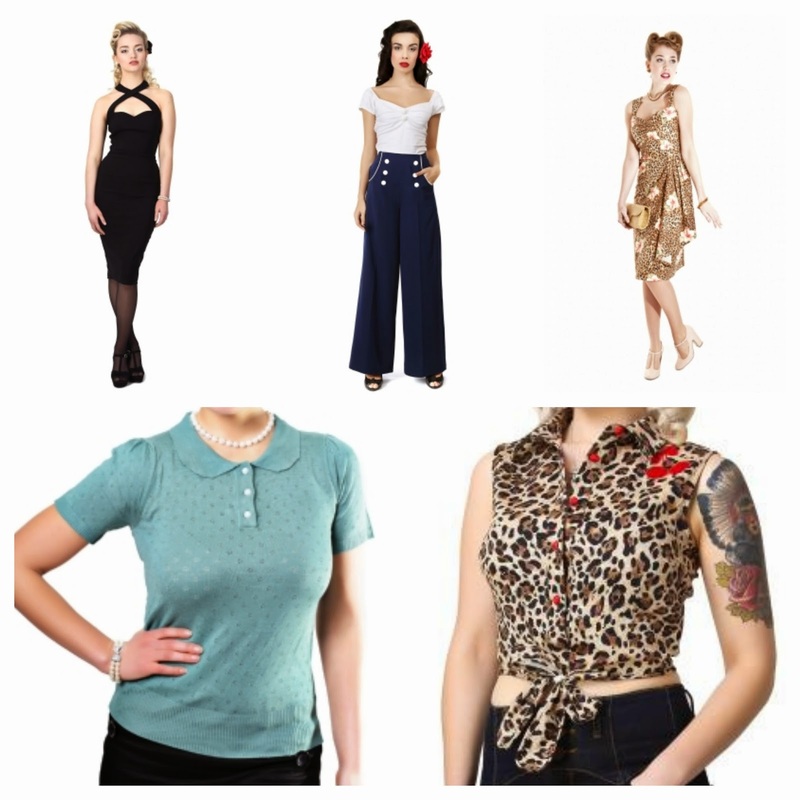 Their collection of dresses and separates cater for a good size range (6-22) and suit a whole host of different tastes, whether you're a pin up honey or a 40s lindy hop gal, Collectif has the perfect outfit for you. I've done a bit of a wish list based on my retro preferences and sorry gals, but not a circle dress in sight, they are just too girly for me. I prefer my retro look more streamline! Clockwise starting from the top left corner, this Penny pencil dress is so beautiful and versatile, yeh sure it looks great styled vintage-esque but I think this could easily be worn in a completely modern way. It's classic and timeless and the perfect blank canvas. The Bernadette sailor trousers are just the most adorable pants I've ever seen, think South Pacific, retro honey. wear with a tie up shirt or racer back vest for a cute tomboy look. A sarong dress is my ultimate vintage want, I still haven't found the perfect one, but the Tallulah is pretty close. I love the tiki style print, if you're going to go for a dress like this, there's no room for subtlety. I'm no stranger to leopard print, I have probably more than is appropriate for one girls wardrobe, so hey, what's one more piece?! This tie top is beyond cute. And finally this cute little jumper reminds me of my nanna, she used to wear jumpers like this all the time, granted, normally with really horrible camel coloured slacks and slippers, but it's just so sweet. I'd team it with high waisted, skinny leg jeans and ballet pumps. Have you got your eye on anything from Collectif? Do you prefer big and girly or a more structured look? That Penny Pencil Dress is gorgeous! And I'm the same, definitely prefer streamlined! I really like Collectif but gotta say I always look first at the dresses but looking at the separates I think they would be a better use of my money especially the top (like my Nanna used to wear too) and the sailor trousers! I am now off to check out their separates and add them to my ever growing lust list!